In the eyes of many Georgians, McCain stood for the America of old, the 'tear-down-this-wall' America. Outside the United States, the loss of Senator John McCain has been felt perhaps most deeply in Georgia, which lionized the late Arizona Republican as the best friend it had in the country Georgians regard as their closest ally. Now, some Georgians have proposed honoring McCain’s memory with a street bearing his name. “Georgia lost a friend, America lost a patriot,” the American embassy in Tbilisi said in a Facebook epitaph to McCain that was met with an outpouring of condolences from ordinary Georgians. A local Baptist church held a memorial service in McCain's honor. “He left an indelible mark in modern history of this planet,” Bishop Malkhaz Songhulashvili said at the service. European Georgia, an opposition party, proposed naming a street in capital Tbilisi after McCain. The city already boasts a George W. Bush Street, complete with the former president’s photo, as well as a prominently placed statue of another Republican hero, Ronald Reagan. In Georgia, distant from the highly polarized American domestic politics, the admiration for McCain largely stems from his steadfast support for Georgia in the nation’s chronic conflict with Russia. In the eyes of many Georgians, McCain stood for the America of old, the tear-down-this-wall America. “He was the last old-school American statesman, who like Reagan cared about freedom around the world,” one U.S.-educated Georgian wrote on her Facebook page. 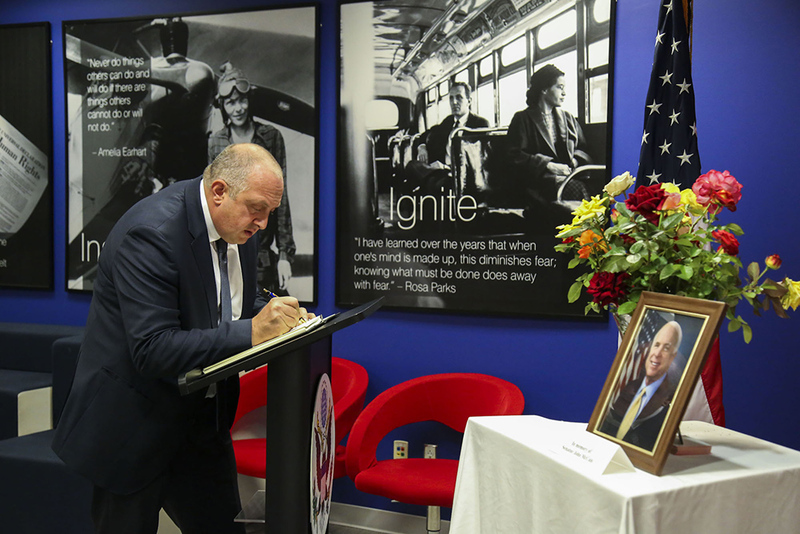 “Senator McCain embodied everything we love about America, determination, commitment to principles and integrity,” said Georgian President Giorgi Margvelashvili who, along with many other Georgian officials, visited the U.S. Embassy to pay their tributes. McCain's words of ten years ago, when Georgia and Russia came to war, are seared into many Georgians’ memories: “Today, we are all Georgians.” He was awarded the title of National Hero in 2010 for his steadfast support for Georgia. To many Georgians, McCain’s words and actions stood in sharp contrast to Obama and Trump administration policies that have been seen as excessively solicitous of Russia. Obama’s policy of “reset” with Moscow and Trump’s praise of Vladimir Putin have not earned either man many fans in Georgia. Several Georgian news outlets recently polled their readers about having a McCain street in Tbilisi and half of the respondents were reportedly supportive of the proposal. Tbilisi Mayor Kakha Kaladze said he was receptive to the idea, but that it would first have to approved by city council.